BIRMINGHAM, Ala. – A fertilized human egg develops into multiple tissues, organs and about 200 distinct cell types. Each cell type has the same genes, but they are expressed differently during development and in mature cells. Understanding the mechanisms that turn sets of genes on or off is a fundamental quest in biology, and one that has clinical importance in diseases like cancer, where gene control goes awry. University of Alabama at Birmingham researcher Hengbin Wang, Ph.D., and colleagues have identified one such mechanism. In a paper published this week in Proceedings of the National Academy of Sciences, Wang and colleagues describe a key role for a protein called RSF1 in silencing genes. Besides the molecular biology details, the researchers also showed that disruption of RSF1 expression in the embryos of African clawed frogs caused severe developmental defects in the tadpoles — through a dysregulation of mesodermal cell fate specification. RSF1 acts on chromatin, the organized structure of the chromosome where the 6-foot-long DNA of each human cell is highly condensed by wrapping around spools of histone proteins. Chromatin is not static, however — it is highly dynamic and changes in its structure to control different physiological processes. One contributor to chromatin fluidity is modifications of the histone proteins made by adding or removing chemical groups to the histone tails. The histones can be modified by acetylation, phosphorylation, methylation, ubiquitination or ADP-ribosylation. 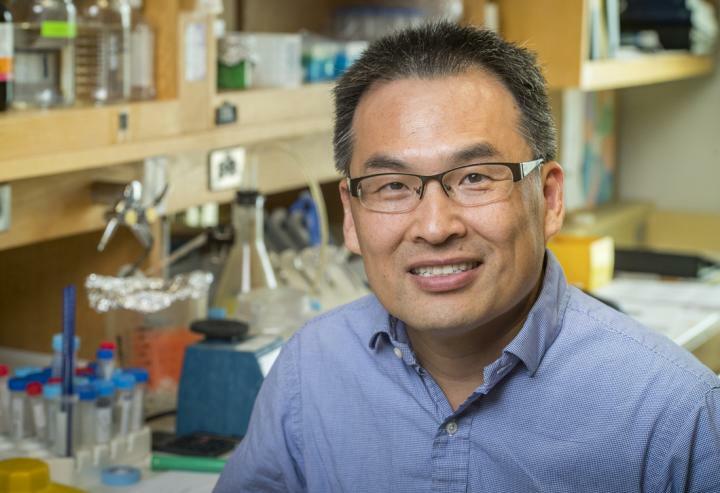 In his current work, Wang, an associate professor of biochemistry and molecular genetics in the UAB School of Medicine, focused on the addition of ubiquitin to the histone subunit H2A. This prevalent modification is linked to gene silencing, and removal of ubiquitin from H2A leads to gene activation. Wang and colleagues discovered that RSF1 mediates the gene-silencing function of ubiquitinated-H2A. They found that RSF1 — which stands for remodeling and spacing factor 1, a subunit of the RSF complex — is a ubiquitinated-H2A binding protein that reads ubiquitinated-H2A through a previously uncharacterized and obligatory ubiquitinated-H2A binding domain. In human and mouse cells, the genes regulated by RSF1 were found to overlap significantly with those controlled by part of a complex that ubiquitinates H2A. Knockout of RSF1 in cells derepressed the genes regulated by RSF1, and this was accompanied by changes in ubiquitinated-H2A chromatin organization and release of linker histone H1. In the paper, Wang and colleagues proposed a model for the action of RSF1 in gene silencing. Wang says knowledge of the ubiquitinated-H2A binding site may help in the discovery of other ubiquitinated histone-binding proteins. Corresponding authors of the PNAS paper, “Role of remodeling and spacing factor 1 in histone H2A ubiquitination-mediated gene silencing,” are Wang; Chenbei Chang, UAB Department of Cell, Developmental, and Integrative Biology; Jianjun Luo, Institute of Biophysics, Chinese Academy of Sciences, Beijing; and Louise T. Chow, UAB Department of Biochemistry and Molecular Genetics. At UAB, Chow holds the Anderson Family Chair in Medical Education, Research and Patient Care in the School of Medicine. Co-authors are Zhuo Zhang, Amanda E. Jones, Matthew B. Renfrow, Marina N. Vassylyeva, Dmitry G. Vassylyev, Keith E. Giles and Yue Gu, UAB Department of Biochemistry and Molecular Genetics; Wei Wu and Yue Kang, Institute of Biophysics, Chinese Academy of Sciences, Beijing; Jinman Kim and Woojin An, University of Southern California Department of Biochemistry and Molecular Biology; Xiaobao Bi and Chuan-Fa Liu, Nanyang Technological University, Singapore; Ivan K. Popov, UAB Department of Cell, Developmental and Integrative Biology; Dongquan Chen, UAB Division of Preventive Medicine and the UAB Comprehensive Cancer Center; Ashwath Kumar and Yuhong Fan, School of Biological Sciences, Georgia Institute of Technology; and Yufeng Tong, University of Toronto, Toronto, Canada.